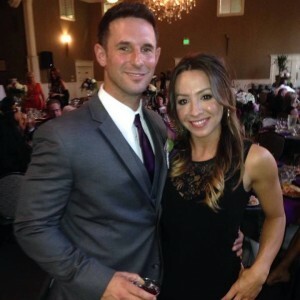 A hair transplant patient from California opens up about his Rahal experience. My real name is Matthew Langford. My full-face photos are on Dr. Rahal’s blog. My blog name is ‘Patiently Waiting.’ I’m one guy in one town in California. And I’m happy to talk with others who’re considering going to Dr. Rahal. I am very open about having had hair transplant surgery. It’s easier to simply tell people than to keep it a secret. It’s not a big deal. And with a first-class doctor like Dr. Rahal, I have nothing to be ashamed of. Hair surgery has definitely helped me stop worrying about my appearance. I’m not always looking in the mirror. It’s been a good thing and it feels good to have my hairline back. He looked twice his age. He felt like he was the right age. But he didn’t look how he felt. And for Matthew, that was a big problem. My hair began thinning in my mid-20’s. The top was thinning but not too badly. The main problem was my hairline and I was very nervous about it. If I’d been in my late 40’s or 50’s it wouldn’t have bothered me but I felt I was too young for the amount of hair loss I had. It hurt my confidence. Looks aren’t everything but I had the finances, I was the right age, and I didn’t want to go through my 20’s, 30’s, and 40’s losing more hair. I tried Rogaine and, to be honest, I don’t think it works. There are more drugs to combat hair loss but I wasn’t going that route: if you’re going to lose hair, you’re going to lose it. I didn’t want to alter my hormones or put chemicals in my body. And I didn’t want long-term negative effects of hair-restoring drugs. I decided I’d rather have surgery — that’s the only thing that corrects hair loss. Matthew didn’t want to travel for his hair transplant. California is a long way from Canada. 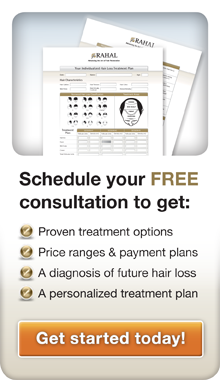 But looking for a hair transplant doctor in California proved fruitless compared to Dr. Rahal’s results. I did a lot of research on hair replacement surgery for about two years. I Googled every which way. I looked at online photos of many doctors’ work and I just wasn’t impressed. Honestly, I didn’t want to go all the way to Canada – I’m in California, USA and he’s in Ottawa, Canada. But from the results I saw, and the patients I communicated with, I decided Dr. Rahal’s the one I wanted. I went with FUT, Follicular Unit Transplantation. Dr. Rahal removed a strip of scalp from my donor zone at the back of my head to get hair follicles to transplant. Part of my decision to go with FUT was cost. FUT is less expensive than other procedures. 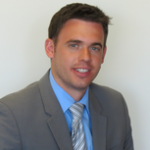 Matthew is one of many patients who were swayed by Dr. Rahal’s confidence, knowledge, and expertise. He explains the value of needing to hear ‘no’ even when you want to hear a ‘yes’. I wanted to be more aggressive with my hairline and fill in my temples but Dr. Rahal said no. And he was right. I tell others, “Don’t doubt Dr. Rahal; just trust him and let him do his thing because he knows what he’s doing.” I’m extremely happy with the results. Dr. Rahal’s clinic is a well-oiled machine. From the time you come in until you leave, they’re super-efficient. 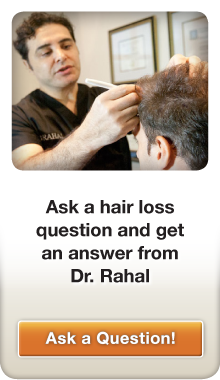 Dr. Rahal works very strategically to make the most of the hair you have and the way he transplants it. The way he places follicles makes your hair look thicker than it is. I try to encourage future patients. Dr. Rahal is a first-class surgeon. He and his people make you really comfortable. They answer all your questions start to finish. My surgery took six hours but I was completely comfortable and relaxed. The surgery was the easiest part. There was a little discomfort here and there but they take care of it. The next few days are a little tougher but tolerable. In the big scheme, hair replacement isn’t a big deal if you’re healthy. So, how is Matthew handling the results of his hair transplant with Dr. Rahal? As well as you’d expect… amazingly! I’m very pleased and happy with the results. I get a lot of compliments. Friends can’t believe how natural it looks. I know I’ll need more hair replacement in the future. There are other clinics but Dr. Rahal’s one of the top guys in the world. I’ll go back to him when I need to. Matthew after his hair restoration procedure, out enjoying life.